If you'd like to go home at the end of a working day knowing you've really helped make a positive change in someone's life, consider a role with Nacro on the Isle of Wight. Eternity Rings or Maternity Rings are the perfect way to express your everlasting love. Serendipity Diamonds on the Isle of Wight have a range of exceptional rings for every taste. Grab your tickets before the sell out for the Brighstone (26th April) or Ryde (10th May) shows. Always popular and well attended. Get up close and personal with the best of the Isle of Wight's stunning scenery; journey from the beautiful chalky cliffs of the west coast to the lush green rolling hills of the east at the 2019 Isle of Wight Walking Festival. No longer is the choice of wedding bands simply gold or silver. These days you can choose from a wide range of metals, shapes, patterns and even have your wedding rings engraved with fingerprints, heart beats or inlaid with exotic, ethically sourced, sustainable woods. 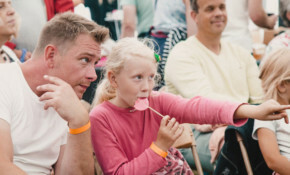 Expect incredible performances, spell-binding storytelling, magical experiences, mad games and wicked workshops, as well as an epic Silent Disco, Baby Massage, The Lego Movie screening and loads of activities and games at this year's Isle of Wight Children's Festival.